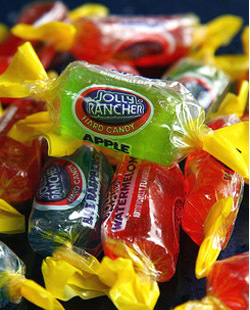 In settlement of a civil rights lawsuit, the City of New York will pay three Brooklyn men a total of $33,000 in connection with their arrests last year after NYPD officers mistakenly identified Jolly Ranchers as methamphetamine during drug busts. Two of the men, Love Olatunjiojo, 26, and Omar Ferriera, 23, were collared after cops approached them shortly after the pair left It’Sugar, a Coney Island candy store where they had bought various sweets, including Jolly Rancher candies. While searching the duo, police recovered a “quantity of methamphetamine” from both men, according to misdemeanor criminal complaints. Police initially reported to Brooklyn prosecutors that the suspected meth field-tested positive for the presence of narcotics. However, a subsequent NYPD lab analysis revealed that the red and blue “crystalline rocks of solid material” contained no controlled substances. As a result, charges against Olatunjiojo and Ferriera were dismissed. A third man, Jimmy Sano, 27, was busted when he protested the arrest of his two friends. Sano, who was with his three-year-old daughter at the time of his arrest, was charged with obstruction and resisting arrest. In April, Sano’s case was adjourned in contemplation of dismissal.